The last question mainly concerns one topic: why on earth did Wilhelm switch the names of the two symbols ‘young yin’ and ‘young yang’? He switched the names of ⚍ and ⚎! But why? He doesn’t discuss the sixiang any further, so there are no clues in his book why he deviated from the Chinese view. Was it a mistake or did he do it on purpose? When I read the relevant chapter in the Dutch translation of Wilhelm’s Yi this question kept nagging me. I wanted to know the reason. I wanted to know why. 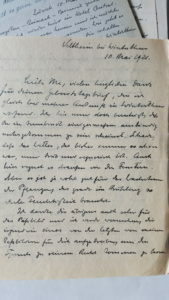 This meant I had to go back to the source: the original manuscript that he sent to his publisher, but I also wanted to see his notes and journals. 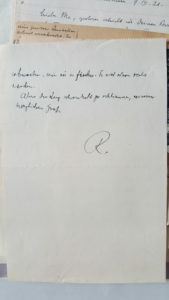 I was curious where these were kept so I sent a mail to Bettina Wilhelm, granddaughter of Richard Wilhelm, who made a documentary about her grandfather. She told me that the manuscripts were preserved by the Bayerische Akademie der Wissenschaften in Munich. I had to go to Munich. 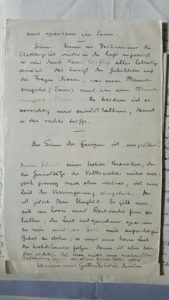 By the time I received Bettina’s reply I had already made up my mind: I would go after the original documents of Wilhelm. If I had to go to Munich for that I would do it. So that is where I am now, sitting at my desk in a simple apartment in the centre of Munich. 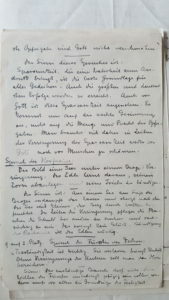 Today I visited the archive of the Akademie, looking for answers. 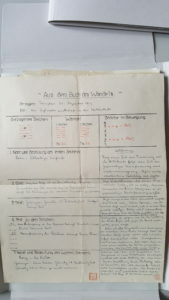 I had already notified the archivist of my visit and gave him a list of the documents that I wanted to see (their website has a database with all the documents listed and a short description of their contents.) When I arrived the archivist led me through a labyrinth of doors and small corridors, eventually leading to a small room that was his office. During the whole day he would sit opposite of me, observing every move that I made, making sure that I did not tamper with the legacy of Richard Wilhelm. The archivist put a box on the table with the files that I had requested. 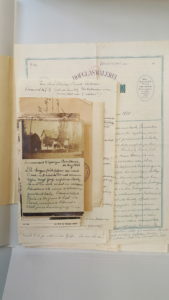 The first map that I opened, the one on top, contained letters and postcards from Richard’s wife Salomé, as well as some letters from his sons. I was a bit shocked by this. Yes, I did request these letters but for some reason I expected that I would start with the documents related to the Yijing, and only after that I would give myself a peek into the personal life of Wilhelm and his family. But now I started with these highly personal documents and I felt a bit ashamed about it. As if I was an intruder. 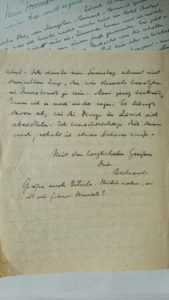 It was touching to read these personal documents, these expressions of affection towards their husband and father (‘Guten Morgen, mein liebes Herzlein!’, ‘Lieber Papa!’). 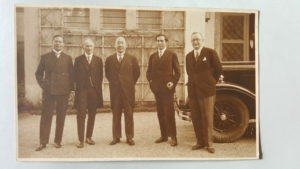 There were also pictures of Wilhelm with other people (and one picture without him, only with other men he knew). Most of these I had already seen in the documentary of Bettina Wilhelm. 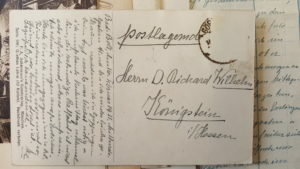 The next map contained letters and postcards from Richard to his wife (affectionally addressed as ‘Me’). They have been sent from several different places in Germany and Switzerland. Wilhelm must have traveled a lot. 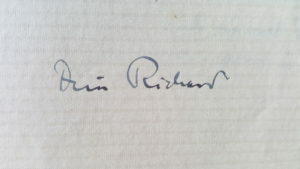 He often signed his letters with ‘dein Richard’ (‘your Richard’) or simply ‘R’. 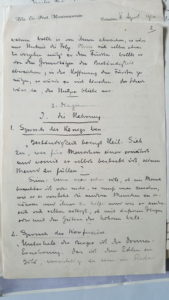 I can’t read German very well, and the handwriting of Wilhelm, often eloquent and sometimes scribbled as if written in haste, doesn’t make it easier. Nevertheless I can decipher parts of the letters, talking about visits from other people, attending a concert and other daily undertakings. 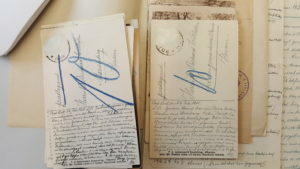 Many letters talk about difficulties that Salomé had to cope with while her husband was away. 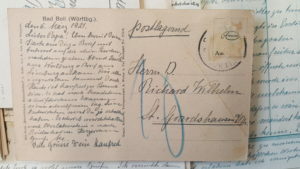 Most of the letters that I read were written when Richard was back in Germany (after 1920), but even then he travelled frequently and did not seem to spend much time at home. 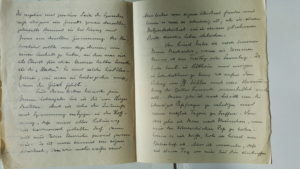 Among the letters were also a few Yijing consultations that Wilhelm did for Salomé and other people. The dates of these consultations are interesting: either the last day or the first day of the year. I assume these were made as prognosis for the upcoming year. He also had a premade form for this that can be filled in with all the details from the consultation: questioner, hexagram, changing lines, the text of the Yi, etc. Although these documents were extremely interesting, giving glimpses of the life and work of Richard Wilhelm and his family, they were not the main reason why I came to Munich. 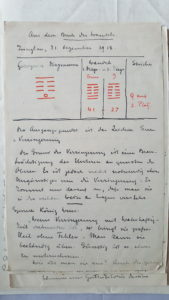 The next maps in the box contained the journals that Wilhelm kept while he was studying and translating the Yijing. 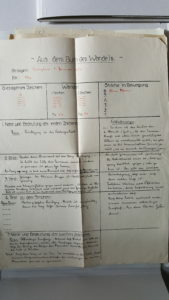 I opened the next map and took the first journal, a notebook marked ‘I Ging 1918/19, 1920. I Ging Text 1-46’. I felt nervous and excited at the same time. My visit to Munich was not in vain. You give new meaning to the phrase “consider the source.” We can consider the source as you, as Wilhelm, and as the Yi itself. It is a wonderful story on many nuanced levels. Your curiosity is our reward. since I am convinced that hexagrams are based on scribing the three lines of the Fuxi trigrams in its development stage (each line either young or at its turning point; old, great) it would mean that deal with a very fundamental issue. It is not only important to know the view of Wilhelm, but moreover why he has come to his conclusion. Knowing you, Harmen, I know that you will continue to search for the original sources as much as possible. Your queeste exceeds the interest of your publisher or yourself, but will be a gift to the whole Yijing community. We are looking forward to your next posts. In the context of infinite changes any cardinal fixing of the 4 emblems is contradictory to infinity. Then, changes can move clockwise and anti-clockwise in a circle, or back and forth on a sinusoid wave. Only in the material world spacetime changes get sequenced. 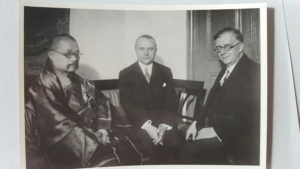 It is here that Wilhelm’s defect of the 4 emblems arrangement, if any, takes place. Then, the discussion is not about the direction of the transformation from yin to yang or yang to yin, but how that transformation shall be symbolized: the usual Chinese way or Wilhelm’s. If you’ll find Wilhelm’s defective arguments, we can also ponder the Chinese arguments, apart from traditionalism (we have always done it that way). As a Wilhelm adept I follow with great interest your findings. Looking forward for the rest of your findings & experiences. Reading your travelogue feels to me more like you’re traveling with Wilhelm than towards (or back to) him. Together exploring things, sending letters or cards back home, seeing people, shopping in old bookstores. It makes my Wilhelm-Yi more alive. Thanks! 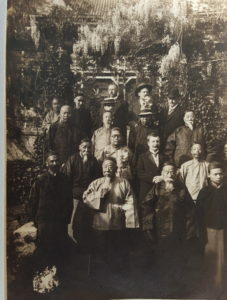 The Chinese Ancients appear to us in Modern times almost as a different species of humanity that defies even the mondern Chinese understanding that I think mostly is due to the overwheming influence of slilence in their day. 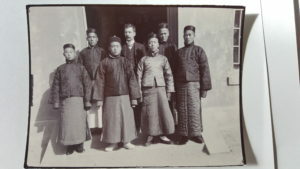 There was little distraction that allowed them to study and derive the I Ching in unchallenged lengths of time to continue an inertia of study much like monks and Sufis devout study of their subjects of interest without interference. The one difference in what was studied is that today we study what those who created a means to understand and formalized a method to understand the relationship of our existence in our universe, a very astute relationship with the core intelligence of some entity that we put into an oracle form. For us in this age we are a bit removed from that direct study due to the volume of detraction and multi-tasking challenges to have the means of long periods of Sllence. We study those who did have it. As it is said that much is lost in translation and the effort to understand the mind of those who we consider the real experts who were themselves one level removed from those who created the original text of natural study. 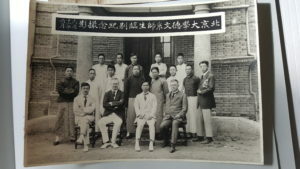 I regard the ancient mind of Chinese scholars to be a difficult task to understand expecially if one is not Asian and was reared soley in the way of impatience and lack of appreaciation of the opportunities of silent study. I appreaciate anyone who can impose upon themselves the patinece of.long study to backtrack through any later texts of translantion to try and create a modern day accuarte guide that the Yiying can be for us. 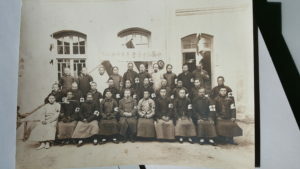 Although I believe that what inspired the ancient deravators and the subsequent translaters as well as the average Yi diviner is not just the inspiration of a correct interpretation for each Hexagram but the spark of intuition that comes from being very focused upon having the clearest understanding at that moment, an answer from a sincerel seeker. I believe that the most perfect relationship with the Yi is the belief that the Yi will always provide the best for you with a natural attempt at balance of all within the realm of dynamic process of llife in the universe. That relationship then creates it’s own path of almost instant understanding making the books that were written to guide you only wise hints and clever clues. It is those texts though that inspires us to understand how to understand best. I´m very happy to find you. I read the Yi jing with my chinese teacher of taijiquan Yuan jun min, (the translation of R.Wilhelm translated to spanish, he also reads in chinese but prefers reads with us and learns language as well). He, as chinese finds this version excellent, very rich and he is very surprised of the infinites details. I appreciate your work. For me is a great notice to know that the work of Richard Wilhem will be recognized and revalued, he was a great man. Thanks a lot, Best regards, Verónica. Thanks Verónica, it was a great pleasure to make this journey. I am glad so many people appreciate my blog entries about it.